The Movement for Secular Democracy (MSD), a Gujarat-based non-profit organization, has clarified in a letter to to the President of India, Pranab Kumar Mukherjee, that it “is not an NGO and does not receive any foreign funds”. The letter comes in the wake of the recent Intelligence Bureau (IB) report, submitted to the Prime Minister’s Office, “Impact of NGOs on Development”, naming MSD as one of the many NGOs which are allegedly involved in anti-developmental activities and are receiving foreign funds. 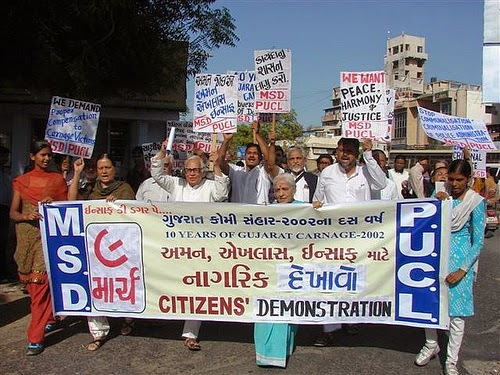 Calling itself as “a broadest platform of the citizens of the civil society of Gujarat”, the MSD has said, “The IB report is designed to muzzle the voices of the citizens defending secularism and democracy inscribed in the Constitution of our country.” Signed by prominent citizens, intellectuals and activists led by veteran Gujarati litterateur Prakash N Shah and Gandhian Chunibhai Vaidya, the MSD said, they have signed a “memorandum, which explains the historic role of MSD in Gujarat for the cause of communal harmony”. Releasing the memorandum, the MSD says, the organization has been fighting for “peace and justice since 1993 and defending secular democracy, and stood by the victims in communal violence.” The signature campaign, in which 100 persons signed up, began on June 25, the day on which national emergency was imposed by Indira Gandhi in 1975. “Contrary to IB's version, MSD is neither a NGO nor it has any relationship with foreign funding”, the memorandum said, adding, it is “purely a citizen’s civil society movement committed to the constitutional values of secular democracy.” It recalled, “In the inaugural speech of this convention, former member of Planning Commission and well known political analyst, Rajni Kothari advocated for democracy against mobocracy and eminent Sarvodaya leader Narayanbhai Desai appealed for unity against autocracy". Pointing out that “'justice for the 2002 carnage victims and desire of peace and amity in the society has been the main slogan of the MSD to which it has firmly adhered to till this date”, the MSD said, several human rights and civil liberties movements, especially the Peoples' Union for Civil Liberties (PUCL), have stood by the MSD. Signatories to the memorandum include Rajmohan Gandhi, Dr Romila Thaper, Prof Yogendra Yadav, Dr Mallika Sarabhai, Dr JS Bandukwala, Prof Gulam Mohammad Sheikh, Prof Dhaval Mehta, Prof Dinesh Shukla, advocate Girish Patel, Fr. Cedric Prakash, Gautam Thaker, Prof Svati Joshi, Gagan Sethi, Prof Ghanshyam Shah, Dr Ram Puniyani, Prof Abid Shamsi, Sukla Sen, Manishi Jani, Dr Saroop Dhruv, Prof Rohit Shukla, Dr Trupti Shah, Dilip Chandulal, Dwarika Nath Rath and others.